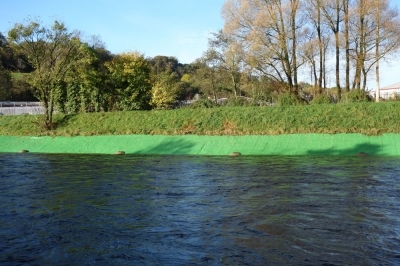 In April 2017, we were contacted by Concrete Canvas to provide a coating to refresh a section of Concrete Canvas Slope Protection along the bank of the River Taff near Pontypridd in South Wales. The substrate itself, Concrete Canvas, is a flexible, concrete impregnated fabric that hardens when hydrated to form a thin, durable, water proof concrete layer. Originally installed in December 2016, the uncoated Concrete Canvas had kept its integrity but was in need of a cosmetic upgrade. A natural shade of green was requested to allow the installation to blend into the surrounding environment. The coating needed to be easy to apply, UV and dirt resistant and able to withstand exposure to the elements. Most importantly, due to the close proximity of the river, the coating needed to be water based and eco-friendly. A solvent coating was unsuitable as it would risk contaminating the water and potentially endangering local wildlife. Based on the customer’s requirements, we recommended ShieldTec Ultra 3000, a hardwearing, high performance water based finish. 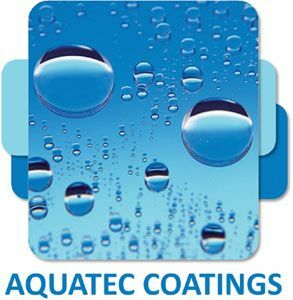 This coating provides excellent outdoor weathering properties including early water resistance, UV and dirt resistance and a tack free durable finish making it the ideal solution for the project. After some initial samples the product was approved for use and a shade of green selected. The coating application was completed in December 2017. “We approached AquaTec Coatings to source a coating that would help to reduce the visual impact of the Concrete Canvas installation and make the product more sympathetic to the surrounding environment. Footage taken of Concrete Canvas Slope Protection installation along the River Taff, Pontypridd, South Wales.